The city of Colchester (population 1,493) is located in western McDonough County. U.S. Route 136 is the main highway that runs through town and connects Colchester to its neighbor seven miles to the east, Macomb. The Burlington Northern Sante Fe Railroad runs through the center of town. The East Fork of the La Moine River touches the outskirts of Colchester. THE FALL OF 1919 WITNESSED A BITTER CLASH OVER EXPANSION OF THE HIGH SCHOOL. FOR SEVERAL YEARS, THE TOWNSPEOPLE HAD WANTED TO CREATE A HIGH SCHOOL DISTRICT THAT WOULD EXTEND INTO THE COUNTRYSIDE, AND, WITH THE LARGER TAXBASE, BUILD A NEW 4 YEAR HIGH SCHOOL. OTHERS WERE AFRAID OF THE EXPENSE INVOLVED. A VOTE ON THE ISSUE IN 1913, HAD RESULTED IN A SOUND DEFEAT OF THE PROPOSITION. BY 1919, HOWEVER, WOMEN WERE NOW VOTING, AND THEY GENERALLY FAVORED THE PLAN. AS A RESULT, A VOTE THAT OCTOBER IN WHICH ALMOST EVERY ELGIBLE CITIZEN CAST A VOTE GAVE THE PROPOSAL A STUNNING VICTORY. A FOLLOWUP VOTE APPROVED THE PURCHASE OF A SITE AND PLANS FOR CONSTRUCTION. BUT THE OPPONENTS REFUSED TO GIVE IN. THEY CHALLENGED THE DECISION ON THE GROUNDS THAT WOMEN REALLY DID NOT HAVE THE RIGHT TO VOTE. DEFEATED IN THE CIRCUIT COURT, THEY APPEALED TO THE ILLINOIS SUPREME COURT WHICH AT FIRST DECIDED IN THEIR FAVOR. THEN THE LEGISLATURE PASSED THE "VALIDATING ACT" AFFIRMING THAT THE VOTES BY WOMEN WERE, AND HAD BEEN LEGAL, SO THE SUPREME COURT REVERSED ITSELF. (KELLY WAS THE BOOTLEGGER) WHEN COLCHESTER HIGH SCHOOL, WHICH HAD ONLY 150 STUDENTS, ORGANIZED THEIR FIRST FOOTBALL TEAM IN 1921, THERE WAS NO MONEY IN THE SCHOOL BUDGET FOR UNIFORMS. LOCAL MERCHANTS FAILED TO CONTRIBUTE, SO KELLY OUTFITTED THE BOYS HIMSLF. HE ALSO LET THEM PRACTICE ON LAND HE OWNED. THE OPENING GAME OF THE SEASON, AGAINST LAHARPE WAS A CLOSE ONE. DURING THE SECOND HALF A FIGHT BROKE OUT, AND KELLY WAS IN THE MIDDLE OF IT. COLCHESTER LOST 19-12. THE TEAM ENDED THE YEAR WITH A WINNING SEASON-7 VICTORIES IN 10 GAMES. IN THE FOLLOWING YEAR THEY WERE UNDEFEATED, AVERAGING 49 POINTS A GAME. 1925---THE PUBLIC SCHOOLS WERE VISITED BY A DELEGATION ON THE KLANSMEN IN UNIFORM, AND A SHORT SERVICE WAS HELD AT EACH BUILDING, AND AN AMERICAN FLAD WAS PRESENTED TO EACH SCHOOL AND A BIBLE WAS GIVEN TO EACH ROOM. 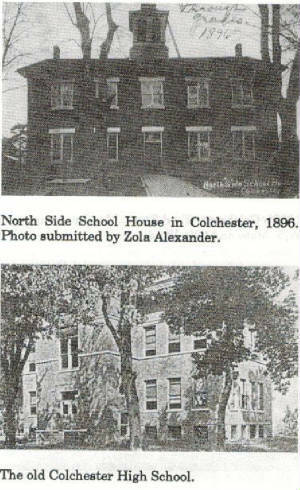 The first graduating class from Colchester High School received their diplomas in 1891 or possibly 1892. 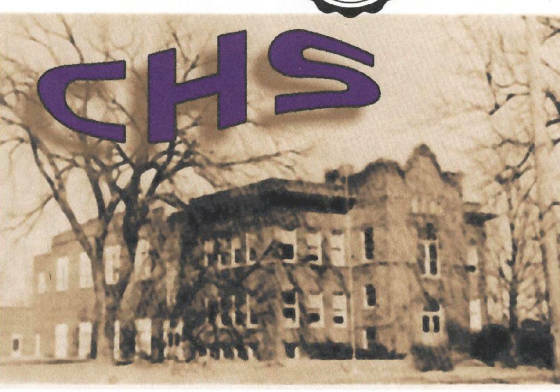 The original high school building closed in 1969. The new building graduated its first senior class in 1970. Colchester High School reached enrollments as high as 230 students in the "baby-booming" mid-1970's. We are told that enrollments in the 200 to 250 range were the norm for the late 1950s and 1960s with Colchester High Schools largest graduating class occurring in 1961. 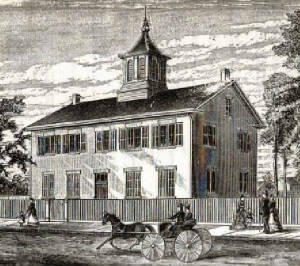 In the late 1940s the students from nearby Tennessee High School joined the Colchester school system. 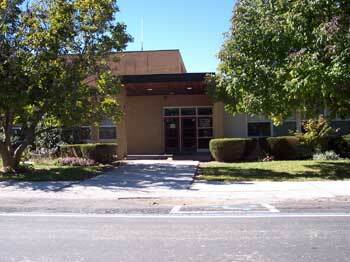 Colchester built a new grade school building in 1955 and were joined by the kids of Tennessee Grade School in 1956. The school system faired extremely well through the early 2000s. Consolidation talks loomed heavy between Colchester and Sciota Northwestern High School. 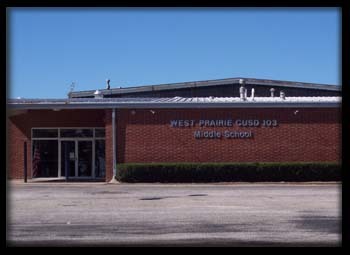 This became a reality after the 2003 school year with the creation of the West Prairie School District. The Colchester school building serves the West Prairie system as there are two West Prairie Schools located in Colchester, the Middle and Elementary schools. The West Prairie Middle School served as Colchester High School from 1970 until its closing in 2003 and is pictured above, along with the original high school building. If you can assist us with some more of the facts we have listed, please drop us an e-mail at ihsgdwebsite@comcast.net. CCCHE - EEEST - TTTER ... C H E S T E R!!!!!! Go get a sandwich or hit the restroom if you need to, the Colchester High School Indians have a lot of things for you to read about regarding their athletic program. IHSA success was acheived in Boys Baseball, Boys Basketball, Boys Track, Boys Cross Country, as well as Speech Individual Events and Drama Team Events. But wait until you take a look at the incredible Girls Volleyball success achieved at Colchester High School. Coach Terri Paul built what only can be described as a dynasty at Colchester from 1987 through the final year CHS was open in 2003. She has continued her success at West Prairie as well. The many successful teams and seasons enjoyed at Colchester High School are listed below. The seasons, one by one as listed on the IHSA web site, are listed below. 2nd Place In Class A!!!! In addition, the following records are recognized among the greatest performances in IHSA history in Girls Volleyball. Coach Terri Paul - The IHSA record book needs updating here. It lists Coach Paul as the 24th all-time winningest coach in girls volleyball history with 478 wins from 1982-2000. This places her #24 in state history. 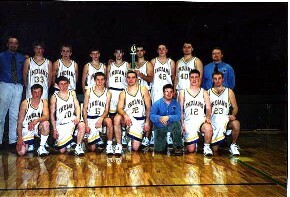 However, the record for the 2002 season is not listed and Coach Paul added 64 more since in 2001 (34) and 2003 (30). This alone would move her up to #20 all-time. As stated before, Coach Paul adds to her record each year as she is still the head volleyball coach at West Prairie High School, a career spanning 22 years (so far). In fact Coach Paul is listed in the IHSA record book as having won 761 matches through the 2012 school year. This ranks Coach Paul 12th all-time in state history. Coach Paul continues to coach at West Prairie High School and adding each year to this number. Truly incredible and amazing for such a small school. If anything was missed or needs correction, please drop us a line at ihsgdwebsite@comcast.net. 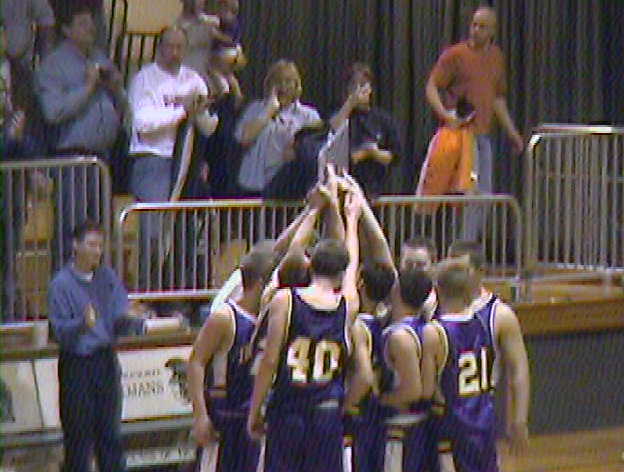 The boys basketball team at Colchester also had many years of success. Included were three District and five Regional titles. Some of the most intense games played on the hardwood were against Colchester's neighbors from the east, Macomb Senior High School. In spite of large disparity in enrollment, the Colchester kids always "got up" for this game and gave the MHS boys a good run. In the early/mid-1960's, some classic games were played including the 1962 contest in which Colchester came out on top 52-50 in a double-overtime thriller over their highly favored opponents. Though overall Macomb held a decided advantage in victories, this was a classic rivalry for the Colchester kids. The enrollment difference ended the annual contest in the late 1970's. Records and some coaches names for the great teams are being sought. Manual lost in Sweet 16 Rd. Moline placed 3rd in IHSA Tourney! Pekin lost in Sweet 16 Rd. Monmouth lost in Sweet 16 Rd. due to illness. Coach Sullivan coached the remaining 23 games. Coach Won / Lost Pct. **There are a lot of season without rebounding statistics available. Incredible research by Coach Sullivan! 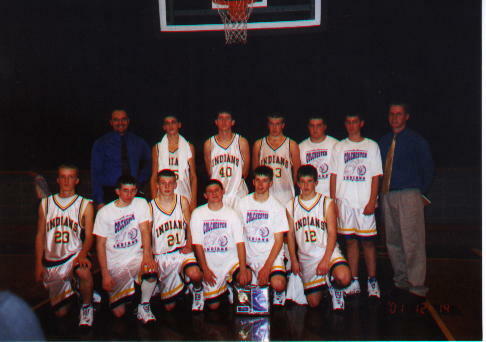 In a December 13, 1997 game against LaHarpe, the Indians' Jeremy Royer made 21 free-throws, most in school history. He went a perfect 20-for-20 from the "charity stripe" in the fourth quarter. "Some top players on those Colchester teams included Mark Booth '72, Steve Bice '75 (averaged 27.2 ppg. ), and Don Markey, '76 5'9" center on that Regional Championship team." "Kudos to Coach Icenogle nonetheless, he was a tremendous coach and role model. It's a shame coaches today don't emulate his patience and poise." The Cochester hardballers also brought home IHSA hardware. The season records and coaches names are not available. One Colchester thinclad brought home a 2nd place finish from the IHSA State Track Meet. The strongest sports program in Colchester, Illinois, from the early-to-mid-1970's, was the cross-country team which, from 1970 to 1974, compiled a record of 55-17 under coach Charlie Schwalm. The highlight was a 15-0 record in 1971 which included a conference championship...the Indians also won numerous invitational meets during those years. Colchester High School was one of the smallest schools in the state to field a cross-country team yet had tremendous success. Although at the time there was only one class for cross-country, the Indians advanced teams or individuals from regional to sectional competition each year from 1971 to 1974. Some of the outstanding runners for Colchester during those years were Rick Beal, George Lewis, Greg Bartlett and Don Markey. Other top runners included Craig Vawter, Billy Clark, Tim Roberts, Robert Duffy, Sam Moran, Mike Lung and Gordon Switzer. Also among key runners were Jon Nicholas, Rick Louderman, Randy MacBeth, Rick Wetzel, Scott Clauson, Steve Biswell, Chris Smith, Danny Powell, Ron Porter, Chuck Carlton, Kendall Knowles, Darrell Waller and Scott Parker. Schwalm went on to build an outstanding distance program at Class AA Canton, IL. after leaving Colchester. Highlights included a 14-1 record in 1978...the core runners from that team would go on to win the state Junior College championship at Spoon River College in 1980. "It's hard to believe that it's been forty years since those glory days of Colchester cross-country. I can still remember walking the course with a measuring wheel that I borrowed from the local power company to get the right distance," said Schwalm. "Dominating the Southeastern Invitational with a one-two finish by Lewis and Markey and six runners in the top fourteen was probably our best meet." "In 1974, we were among only eight schools out of the 120 that qualified for sectional who would have fit under the new two-class system, with an enrollment cutoff of 750 students, which started the next year after I left," added Schwalm. "Those were truly wonderful times that I still vividly remember." Two Colchester girls won 2nd place finishes in the entire state in speech competition. The Drama team also qualified for the state competition by winning their Sectional one year. Their accomplishments are listed below. The Illinois Theatre Festival is the largest, non-competetive high school theatre festival in the world. It was organized in 1976 by teachers from the Chicago suburbs. This festival is still going strong as they perform at the University of Illinois (Champaign-Urbana) and Illinois State University every other January. Colchester High school participated in this festival in 1981 and 1989. Colchester participated in Scholastic Bowl competition for sure in 2001-2002.